Academic Status: 1st year, Class -13 Age: 15-16 Blood Type: AB Minus Name: Real Eater She is a freshman of Class 1, later Class -13, and Zenkichi Hitoyoshi's best friend. A member of the Shiranui Household, Shiranui serves as Medaka Kurokami's double until the end of the Jet Black Wedding Feast, after which she is chosen to become the next Iihiko Shishime. When Medaka entered Hakoniwa Academy, Kajiki Kurokami sent in Shiranui to act as Medaka's double without Medaka's approval. As Medaka's "ghost support", Shiranui's assignment was to help Medaka from behind the scenes, doing the things Medaka could not.Shiranui first met Zenkichi when she intentionally dropped her eraser in front of him, planning to become friends with him to get closer to Medaka.Shiranui was eating out of a boxed lunch since first period;upon finishing that one, she took out another, and would have another five or six before an onigiri for dessert.Shiranui paused in her eating when she noticed Zenkichi watching her. She then dropped her eraser while having a rice ball.With Zenkichi's accompanying reaction to picking up her eraser, Shiranui first dropped her rice ball in surprise, then burst out laughing. Telling "Erase Man" he was funny, she introduced herself. The comic relief of the series and the granddaughter of the Academy's principal. Shiranui is normally a very cheerful and hyper girl, but she has been shown to have a dark side and is brutally tactless. Despite her small size Shiranui has a very large appetite and is constantly seen eating, even while walking. She has a knack for finding clandestine information with ease, knowing about most things that would seem to be vague details, and is unusually perceptive. Shiranui harbors a hidden resentment against Medaka. Because of the antagonism that exists between them, Medaka initially asks Shiranui to become the Vice-President of the Student Council, though Shiranui refuses. She is also almost always seen hanging around with Zenkichi. 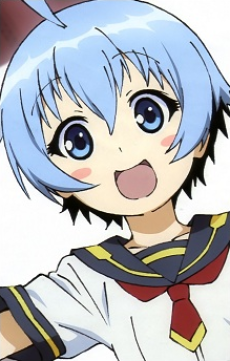 While she prefers to remaining on the sidelines observing and is extraordinarily capable of removing herself from any danger, Shiranui elects to join Class -13 after encountering Kumagawa. With this choice decides to test her friendship with Zenkichi which reacts in an unexpected way: worrying about her safety without ever questioning their friendship. Despite her claims to not care for anyone nor having any friends, it seems that she has deep feelings for Zenkichi. Recently, her ability has been revealed as "Real-Eater." Though demonstrated, the properties of Shiranui’s Minus have yet to be explained. She is shown using it on Kuudou Hinokage, which she calls “lending” it to him. At the same time, she claims that her Minus isn’t very convenient to use. After this encounter, Hinokage has developed a new Abnormality he calls Theme Song, though how it relates to Shiranui’s Real Eater is still unknown. Her grandfather originally saw her as the base for Class -13, suggesting that she has abilities on par with those of Kumagawa, and he himself recognizes the similarites between them. She was also able to come out of attacks by both Shibuki Shibushi and Kagamaru Chougasaki unscathed.